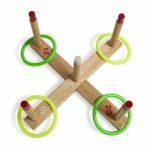 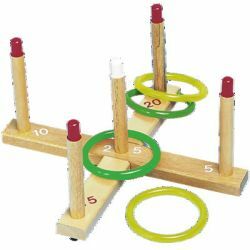 Designed for all-ages fun, the solid wood Champion Sports Ring Toss Set will bring some friendly competition. The classic game of ring toss helps youngsters improve their hand-eye coordination, precision and accuracy in a simple two-player game. Scorekeeping is easy using the labelled base, and non-abrasive plastic rings mean you can play the game inside when the weather turns.